Singer Jack Johnson joined the Students’ Day planning team. 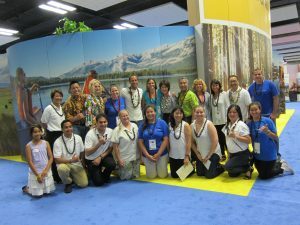 For 10 days last month, Hawai‘i was at the center of global attention as more than 10,000 participants from 192 countries met at the IUCN World Conservation Congress to discuss how to move the planet from “a tipping point to a turning point,” with the link between island culture and the natural world at the forefront. Joining the delegates were 1,000 students who attended a “Students’ Day Youth Challenge.” As part of the Congress Legacy Initiative, First lady Dawn Amano-Ige announced $60,000 had been donated from Kamehameha Schools, the Harold K.L.Castle Foundation and the Public Schools of Hawaii Foundation to fund school conservation projects. • Joining the Global Island Partnership to develop locally and culturally appropriate models for sustainability. Why 30 percent? According to scientists, this number represents a “tipping point” or crucial marker beyond which it is difficult to reverse negative effects. One thing is certain: Hawai‘i left its mark on a world stage at the Congress, along with a set of 100 commitments approved by the delegates to chart a better course for Island Earth.